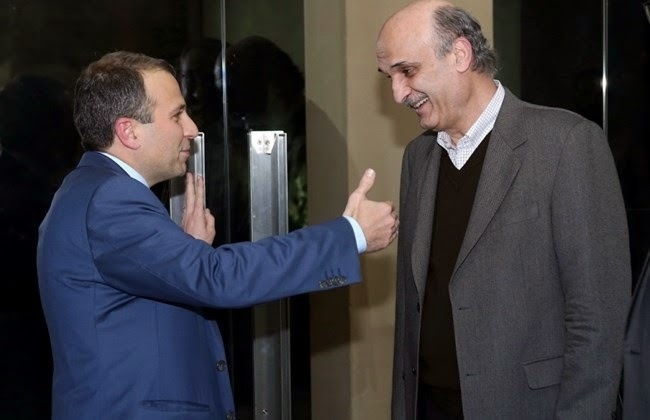 BEIRUT: Free Patriotic Movement minister Gebran Bassil met with Lebanese Forces chief Samir Geagea late-Monday, amid attempts to broker a meeting between the leaders of each party seen as crucial to ending the country's presidential impasse. A statement from Geagea’s office Tuesday said he and Bassil, who is Lebanon's foreign minister and the son-in-law of FPM chief Michel Aoun, discussed many issues, including granting Lebanese expatriates dual citizenship. The two-line statement did not make reference to the anticipated dialogue between Geagea and Aoun, but Bassil is the highest ranking official affiliated with the FPM to visit the LF chief over the months of preliminary talks. Ibrahim Kanaan, the head of Aoun's parliamentary bloc, had visited Geagea twice in recent weeks to lay the groundwork for dialogue. The talks are seen as an effort to break the presidential impasse. The country has been without a president since May. Both Aoun and Geagea are candidates, but neither has enough parliamentary support to win. Aoun said last week that minor progress had been made in the presidential crisis, despite the generally gloomy prospects for ending the deadlock that has left Lebanon without a president for 10 months.